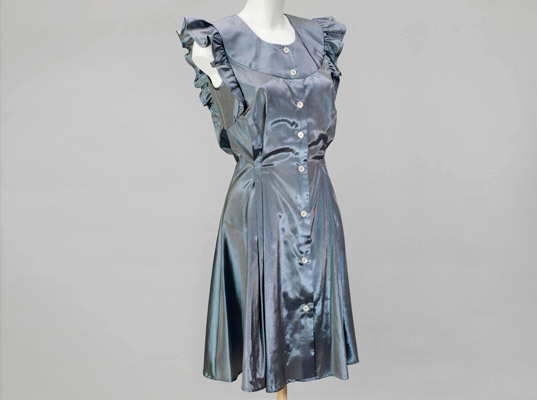 Your eyes do deceive you—the sumptuous iridescent hue on this dress is purely a trick of the light. Sydney designer Donna Sgro fashioned the frock from Morphotex, a nanotechnology-based, structurally colored fiber that mimics the microscopic structure of the Morpho butterfly’s wings, which despite lacking color, appear a shimmery cobalt. Manufactured by Teijin in Japan, Morphotex requires no dyes or pigments, nor the prodigious amount of water and energy used in conventional dyeing. Found in the rainforests of South America, the Morpho is one of the largest butterflies in the world, with wings that span five to eight inches. The vivid color on the upper surface of their wings—the underside is a drab spotted brown—is the result of microscopic, overlapping scales that sync up certain wavelengths of light while canceling out others. Morphotex relies on fiber structure and physical phenomena such as light reflection to create its color. Morphotex cribs from Ma Nature herself, relying on fiber structure and physical phenomena such as light reflection, interference, refraction, and scattering to produce its opalescence. The fabric comprises roughly 60 percent polyester and nylon fibers, arranged in alternating layers that can be varied in thickness to produce four basic colors: red, green, blue, and violet. London gawkers can size up the dress for themselves at the Science Museum, where it’s part of the Trash Fashion: Designing Out Waste exhibit. Despite lacking color? Isn't ALL color a "trick of the light"? For all of those readers viewing this that are based in London - this dress is currently on display at the Science Museum, South Kensington. The exhibition it is involved in is titled Trash Fashion which is all about eco-clothing techniques. It is worth a look! Check it out! This is an interesting example of biomimicry. I wonder what the fabric feels like and how it wears. thatonekid08 - It is true that color is caused by the reflection of specific wavelengths of light that strike our retinas, causing the perception of color. However, some color is caused by pigmentation - such as ink on paper and melatonin in skin. What is special about the morpho butterfly and thus this dress and this dress, is that there is no pigment involved. The coloration is caused strictly by nanoscale photocrystals that refract the light in such a way to create this shimmering blue. There's no pigmentation involved. The fabric of the dress mimics this awesome effect. 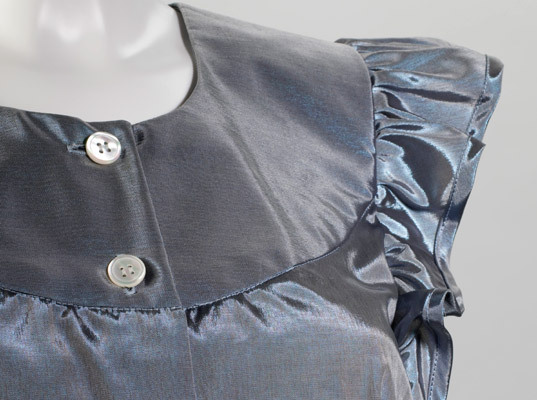 Your eyes do deceive you�the sumptuous iridescent hue on this dress is purely a trick of the light. Sydney designer Donna Sgro fashioned the frock from Morphotex, a nanotechnology-based, structurally colored fiber that mimics the microscopic structure of the Morpho butterfly�s wings, which despite lacking color, appear a shimmery cobalt. Manufactured by Teijin in Japan, Morphotex requires no dyes or pigments, nor the prodigious amount of water and energy used in conventional dyeing.